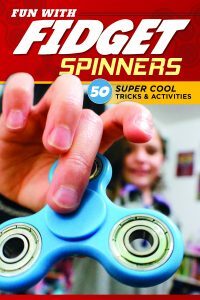 Fun with Fidget Spinners: 50 Super Cool Tricks & Activities is a new one-of-a-kind guide where spinners can take their hobby to a whole new epic level. Spinners can learn how to master tricks such as spinning on a hat or stacking spinners on top of each other to create mesmerizing whirling towers of color! Spinners can also track their progress and tricks with a handy workbook. Plus, the book provides backstory into the health benefits of spinning. I received a copy of this book and have to admit that it really is pretty cool! It’s a fun book for kids ages 7+ and it has really cool tricks!~SoCal City Kids. Fidget spinners are still best-sellers in the toys department of Amazon. The addictive palm-sized toy’s popularity has spread like wildfire. In fact, the toy industry has seen sales over $500m since the trend took off this spring. The activity has been met with a mixture of positivity and also criticism. Some say the toy is great for concentration while others argue it’s just another distraction. I’d like to add to the argument that fidget spinners are a positive and useful toy for children. Fox Chapel Publishing, known for creating crafts, arts, and hobbies books, is adamant about producing books that help users work with their hands, get outside, or inside an art studio, and help them interact creatively with the world around them. Fidget spinners are great for getting kids off devices, but they offer another benefit: social interaction. Children enjoy collecting toys, whether they be Pokémon characters, Beanie Babies, or Pogs, and sharing their finds with their peers. With fidget spinners, children may children like to show off their moves or compete with one another on tricks and stunts. This is one reason Giagnocavo and his team made the decision to include a trick checklist section in their new book. Spreads are provided where friends can respectively track their tricks and time. While some may still say fidget spinners are a nuisance, I challenge them to look at how the whirly gadget inspires children. A simple toy made with a few pieces of plastic is not only getting children to work with their hands, it’s helping children become connected to one another in an increasingly complex digital world. Self Disclosure: A copy of book, images, and article were provided to feature this book.